If you are an Ohio State football traditionalist, prepare to rehash a bulk of distressing memories. The Buckeyes own one of the most iconic uniforms in all of college football but are unafraid to divert from their regular look. It helps make the school (and Nike) more money on apparel and almost always gains the attention of high-profile recruits. Monday, the program confirmed it is set to don another new (but actually old) look in 2016. To commemorate legend Chic Harley's first of three All-American campaigns, the Buckeyes are set to wear a uniform from the 1916 season once this fall. It did not specify for which game. Urban Meyer loves recruiting, so he loves alternate uniforms. In each of coach's first four seasons in Columbus, Ohio State wore at least one substitute kit. The changes to what we know now as the standard look began before he arrived, however. A history of all alternates and changes plus how the Buckeyes performed in each new jersey is below. Ohio State started its trend of one alternate uniform per season in 2009 for its regular season finale against Michigan with a look honored the 1954 national championship team. The Buckeyes racked up 251 rushing yards, capitalized on five Tate Forcier turnovers and earned a berth in the Rose Bowl with their sixth consecutive victory over the Wolverines that day in Ann Arbor. A theme of new threads against Michigan spilled into the 2010 season, once again honoring a national championship team. The look from the 1942 club roamed Ohio Stadium as the Buckeyes trounced Michigan in what was Rich Rodriguez' final appearance in the rivalry as head coach of the Wolverines. Ohio State marked the 50-year anniversary of its unbeaten and national championship-winning 1961 team led by Woody Hayes when it wore this Nike Pro Combat look against Russell Wilson, Bert Bielema and the Wisconsin Badgers at Ohio Stadium. Amid a forgetful 6-7 campaign after the departure of Jim Tressel, Braxton Miller's touchdown pass to Devin Smith with 20 seconds left provided a night of joy for Buckeye fans. 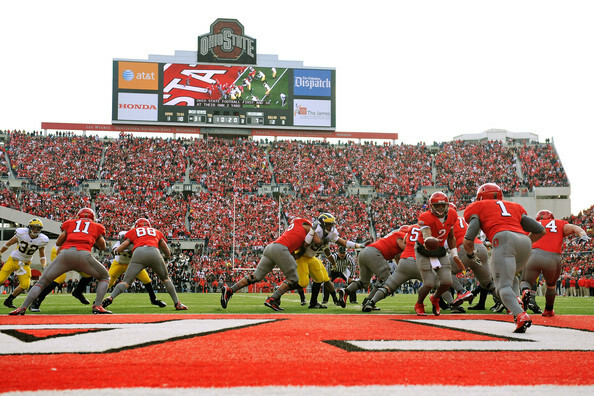 Ohio State went back to its "rivalry" alternate uniform theme in 2012, Meyer's first season in Columbus. The look paid homage to the 1968 national title team, complete with gray numbers and black stripes on the sleeves. We also got a look at a chrome helmet as the Buckeyes topped Michigan to complete a 12-0 season. 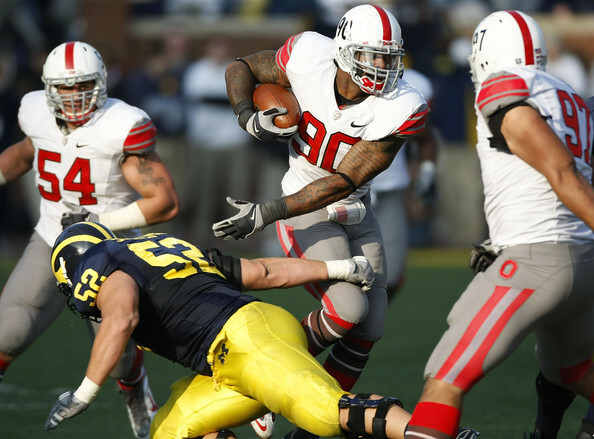 Ohio State rolled out its rivalry uniform from the 2012 Michigan game for a pair of primetime matchups in 2013, first against Wisconsin and then Penn State. Braxton Miller threw four touchdown passes and the Buckeyes fended off a 200-yard receiving day from Badger wide receiver Jared Abrederis to notch their 17th consecutive win. Nearly a month later, that win streak ballooned to 20 with a curb-stomping of the Nittany Lions. Miller accounted for five touchdowns and Carlos Hyde and Kenny Guiton each rushed for two apiece. The jerseys were accented with pink accessories as part of breast cancer awareness month. The chrome helmets returned in November of the 2013 season, but for the first time on the road. 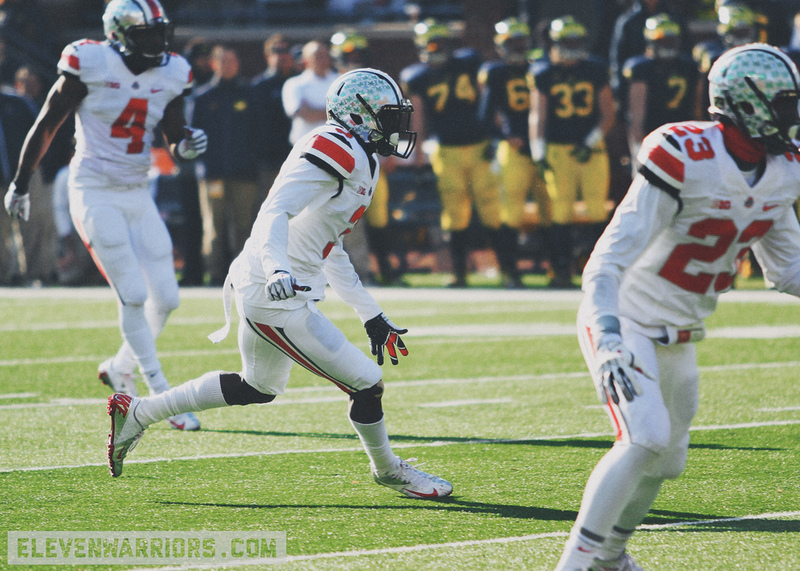 Ohio State busted them out with this fresh, all-white look in Michigan Stadium. Tyvis Powell's late interception of Devin Gardner on a two-point conversion attempt sealed the win. The "Cocaine Whites," as dubbed by our very own D.J. Byrnes, glittered brightly that cold day in Ann Arbor while the Buckeyes won their 24th straight. 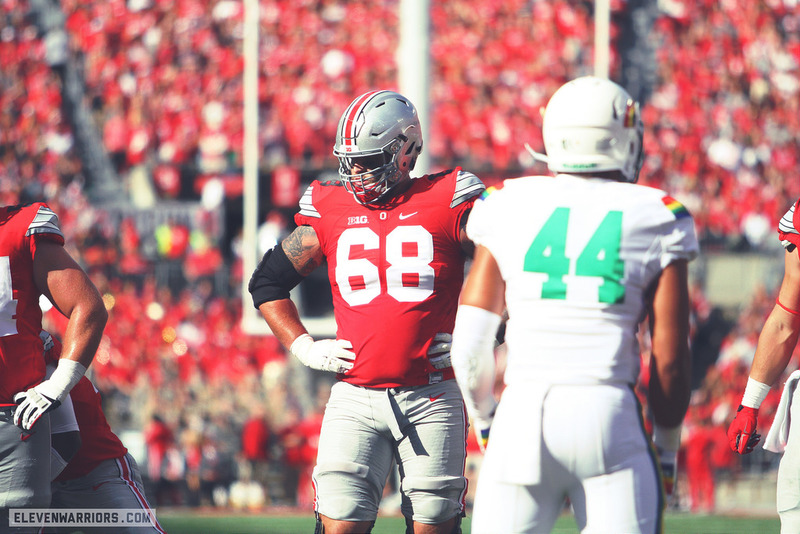 It took eight games for Ohio State to end up on the losing end of a contest in which it donned a uniform from the Pro Combat line. The Buckeyes wore the same look they had twice earlier that year, but the uniform against Clemson was a tad different due to the Orange Bowl patch on the chest plate and BCS logo on the back of the helmet. Braxton Miller led a potent Buckeye offense with four touchdowns against the Tigers, but Clemson's combination of quarterback Tajh Boyd and wide receiver Sammy Watkins proved to be too much. Miller also hurt his shoulder for the first time that night in Miami as Ohio State lost its second-straight game. 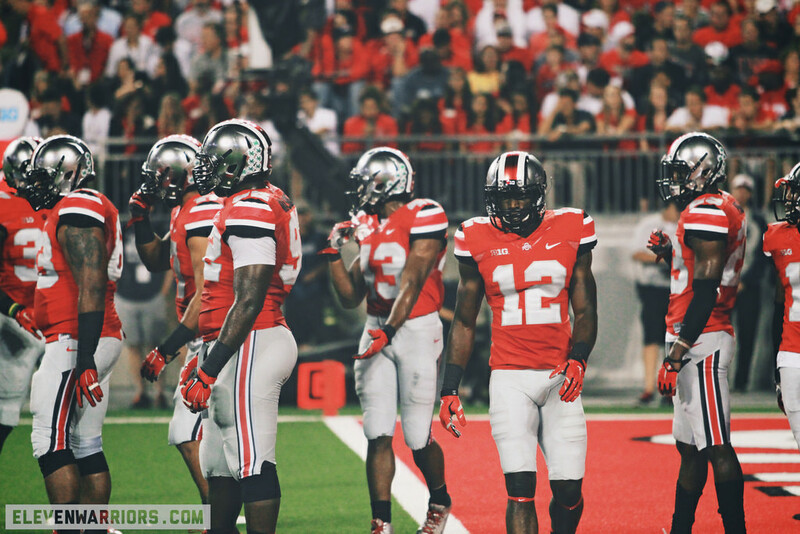 Ohio State again broke out its chrome helmets and Pro Combat uniform for its 2014 home opener against Virginia Tech. Hokie defensive coordinator Bud Foster unleashed a 46 Bear defensive look J.T. Barrett and Ohio State's offense never could figure out and became the only team to beat the winners of the 2014 College Football Playoff. 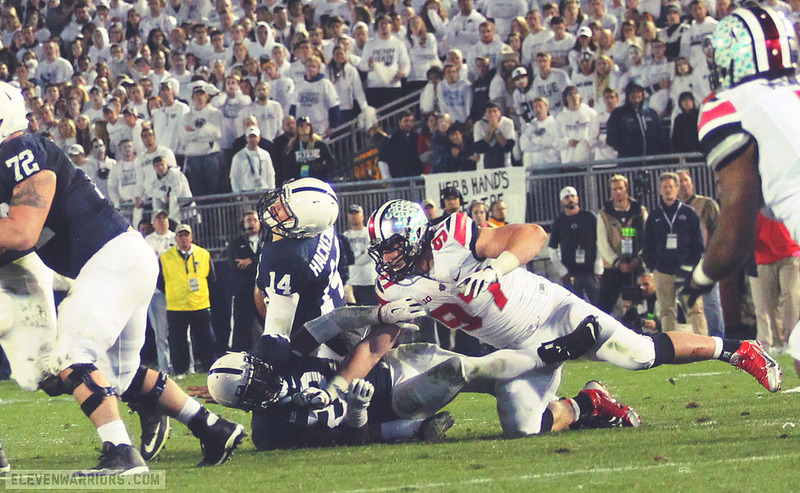 The "Cocaine Whites" returned in force the weekend before Halloween 2014 when the Buckeyes paid a visit to Happy Valley. Ohio State jumped out to a 17-0 lead at halftime, only to see it evaporate as Penn State forced overtime. Then Barrett rushed for a pair of touchdowns in the extra sessions and Joey Bosa buried Christian Hackenberg (and Akeel Lynch) to seal the victory. 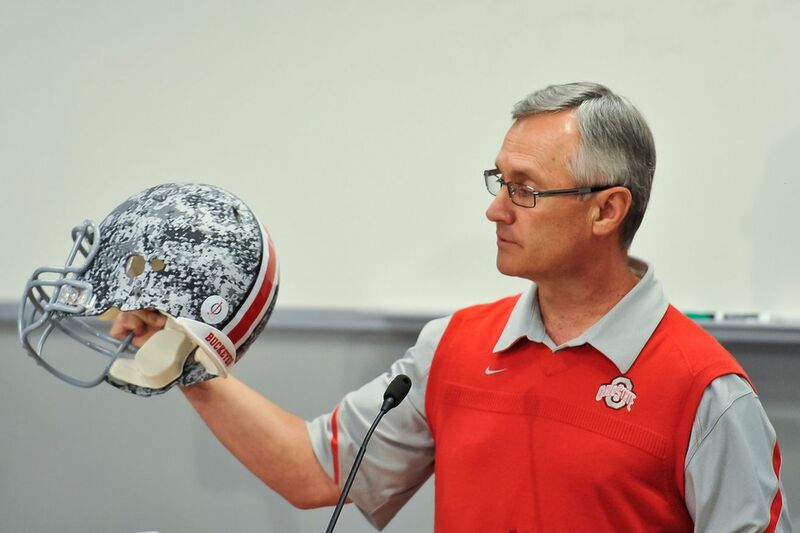 The start of November 2014 marked the return of Ohio State's home Pro Combat uniforms. An easy victory over lowly Illinois came with J.T. 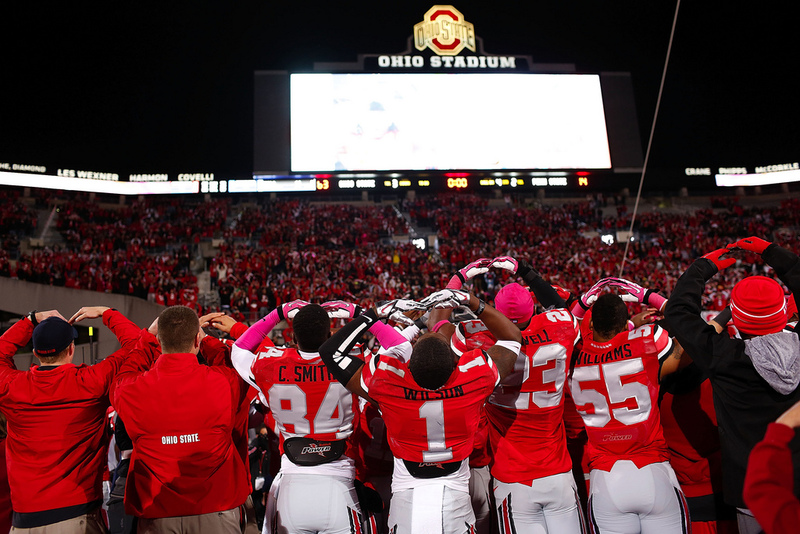 Barrett and Cardale Jones each throwing two touchdown passes as the Buckeyes wasted the Fighting Illini. Arguably the biggest win of Meyer's Ohio State tenure came when the Buckeyes donned a look that at first glance appears as a standard uniform. 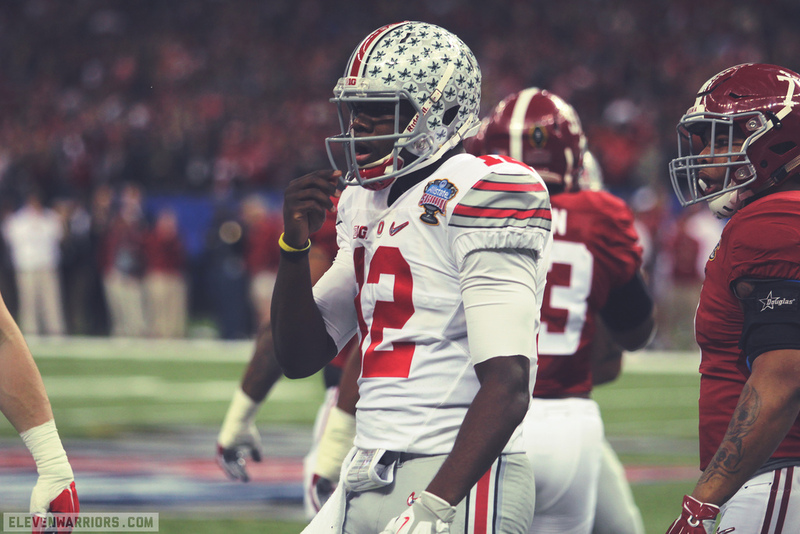 However, the silver Nike swooshes on the pants and jersey are different, along with the Sugar Bowl patch. A College Football Playoff sticker also went on the back of the helmet. 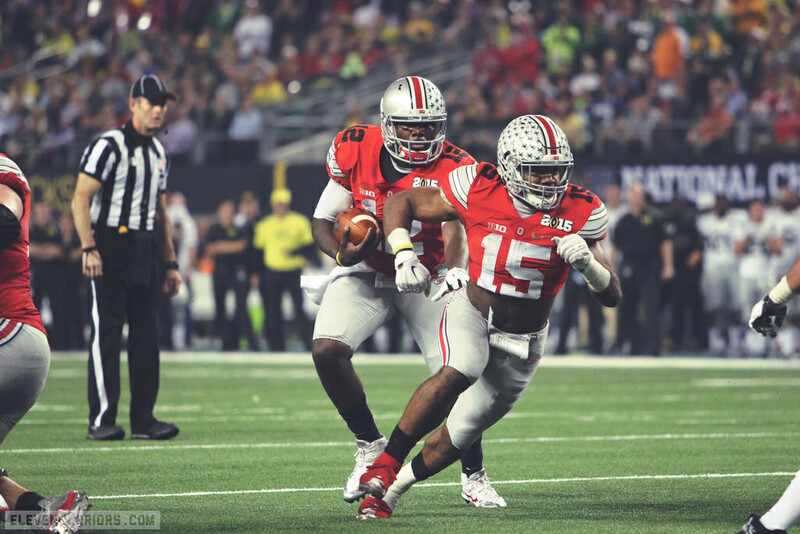 Ezekiel Elliott scored four touchdowns and Cardale Jones continued his rise as the Buckeyes topped the Crimson Tide to earn a berth in the national title game. The scarlet version of Ohio State's Sugar Bowl uniform came to fruition in the College Football Playoff National Championship. The kit still had silver Nike swooshes on the pants and uniform top, but also bore the number "2015" with the College Football Playoff emblem on the chest. Black numbers fell on the shoulders for a clean, sharp look. It is the uniform that lives in Ohio State lore with its eighth national championship. Ohio State's look for its second game of its national title defense was almost identical to its traditional uniform, but the numbers on the shoulders were black instead of white. Also, let's be sure to remember for a moment the suave look the Warriors wore that day in Ohio Stadium. 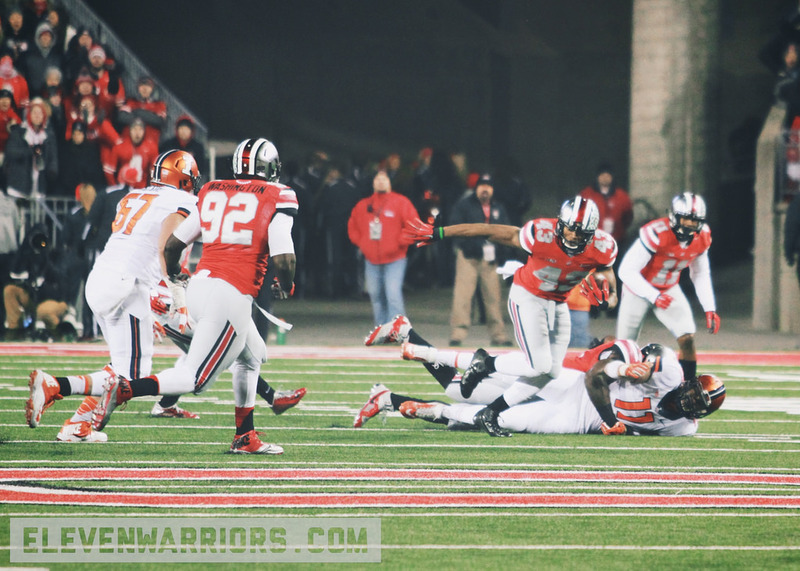 Elliott scored three touchdowns to lead Ohio State in the shutout win. 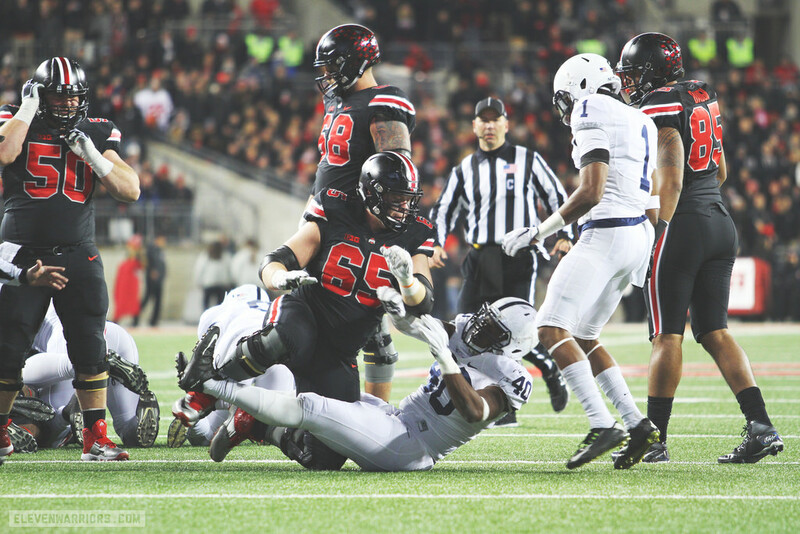 Ohio State went all black for its clash with Penn State under the lights last season. The uniform, pants, and helmets were black, while the Buckeye Leafs on the helmet were scarlet. The change in appearance and four touchdowns from Barrett led to a relatively easy victory in Columbus. Ohio State's lone loss of the 2015 season came when it wore its uniform that boasts black numbers on the shoulders. A decal honoring former Michigan head coach Lloyd Carr's late grandson also found its way on the back of each helmet for both teams. Michigan State broke Ohio State's 23-game winning streak with a field goal as time expired to all but dash any chance the Buckeyes had at returning to the College Football Playoff. In all, Ohio State is 14-3 since 2009 when wearing alternate uniforms. For additional effect, the team wore gray camouflage helmets to honor the military for the 2011 spring game. The Buckeyes are set to break out and entirely new look once this fall when they pay homage to the 100-year anniversary of Chic Harley's first All-American season. Owning the largest apparel contract with Nike in college athletics, Ohio State fans are bound to see some more tweaks to the traditional uniform as well as additional alternates in the coming years. Athletic director Gene Smith said the football team plans to wear at least one alternate each season.